Doosan Infracore Construction Equipment will be showing models from the company’s new ranges of excavators and wheel loaders at an upcoming exhibition for machinery and equipment construction in Abu Dhabi. Intermat Middle East 2012 is taking place from October 8 to 10 at Abu Dhabi National Exhibition Centre. Doosan Infracore will display a wide range of new Doosan Heavy and Bobcat products for the first time at the exhibition. The new range of excavators comprises three models which replace the previous SOLAR range and Doosan will be showing the new DX225LCA and DX340LCA models at Intermat Middle East. With bucket capacities ranging from 2.5 to 5.4 cu m, the new Doosan range of wheel loaders includes four new models that build on the design of the previous Mega range. Two of the four new models, the Doosan DL250A and DL420A wheel loaders, will be exhibited at the show. All the new excavators and wheel loaders offer several improvements for better performance, greater operator comfort, easier handling and serviceability, as well as increased durability and robustness for enhanced reliability and lower running costs. All the new excavators and wheel loaders incorporate several important new functionalities and technical improvements. The Bobcat display will include the latest in telescopic handlers, compact loaders and compact excavators from the company. As well as the company’s popular T35120, T40140 and T40170 models offering maximum lifting heights of 12, 14 and 17 m, respectively, the Bobcat display will also feature the company’s new range of rotary telescopic handlers. The four new 360-degree and 400-degree rotating models, which have been launched to meet an increasing demand for this type of versatile telescopic handler, offer lifting capacities from 3.5 to 5.0 tonne and lifting heights from 15.7 to 24.5 metres. 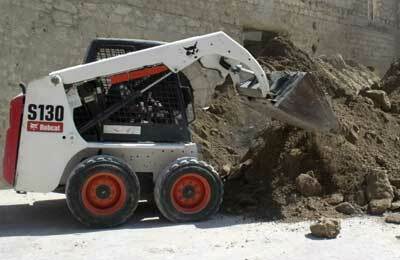 The Bobcat display will also include the S130B model, the most popular skid-steer loader in the Middle East. Powered by the 34.3 kW Kubota V2203 4-cylinder diesel engine, the S130B has an operating weight of 2263 kg, a rated operating capacity of 600 kg, a tipping load of 1200 kg and a lift height of 2781 mm. The strong lift arms, short wheelbase and compact design of the S130B offer superior manoeuvrability for work in tight spaces.